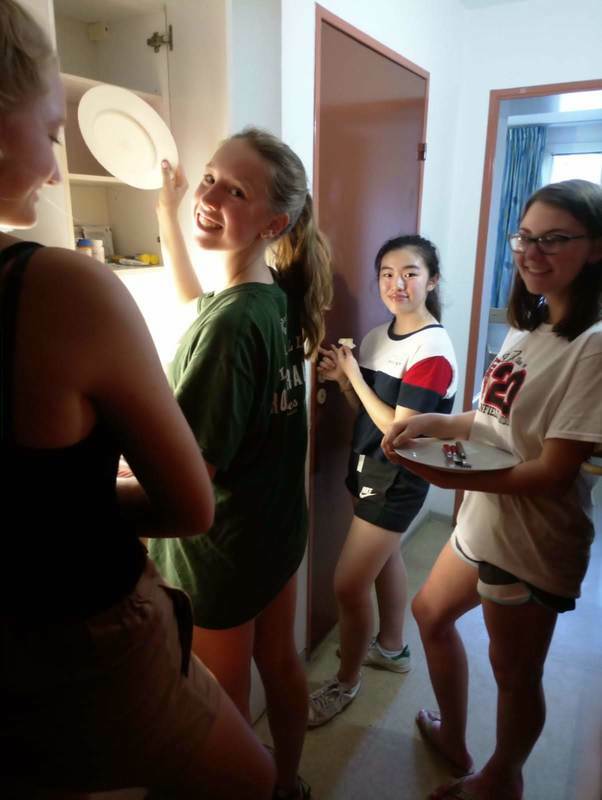 Our fourth week together has been filled with a range of activities! 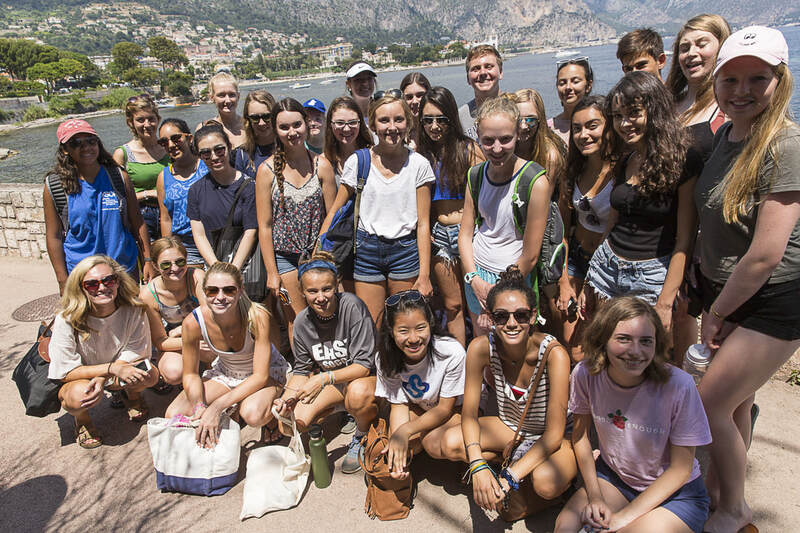 We started off the week right with a post-class afternoon visit to the beautiful Lac Saint-Cassien, just an hour away from Nice. 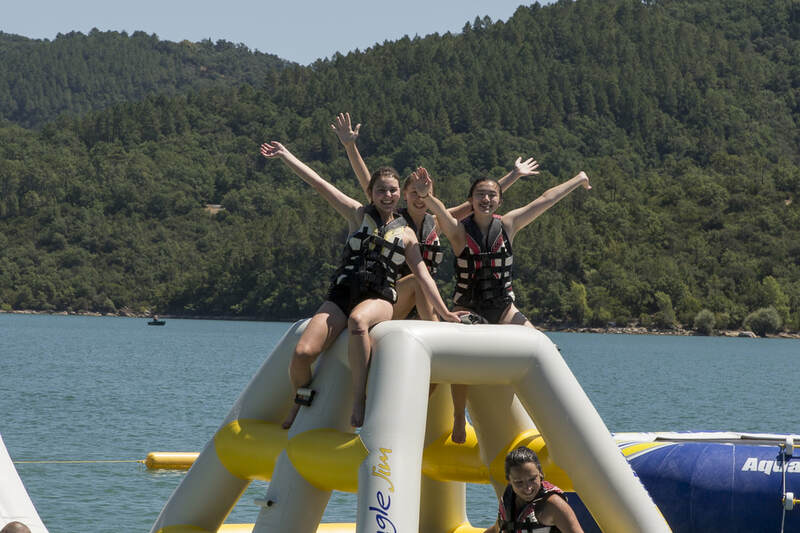 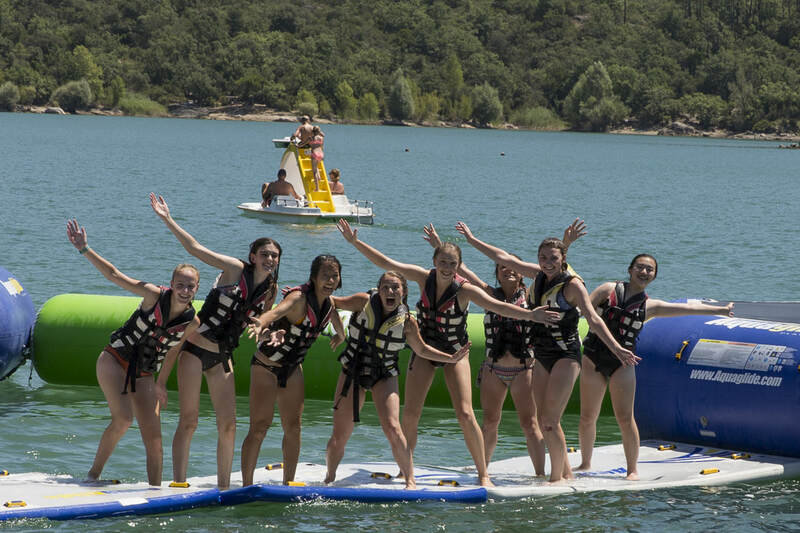 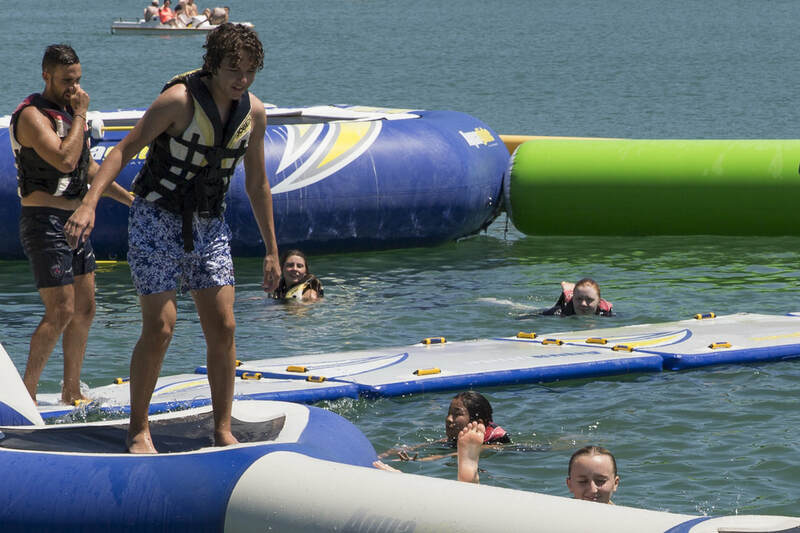 Students spent the day basking in the soleil, finding a break from the heat by jumping in the lake via trampoline or from their pedal boat! 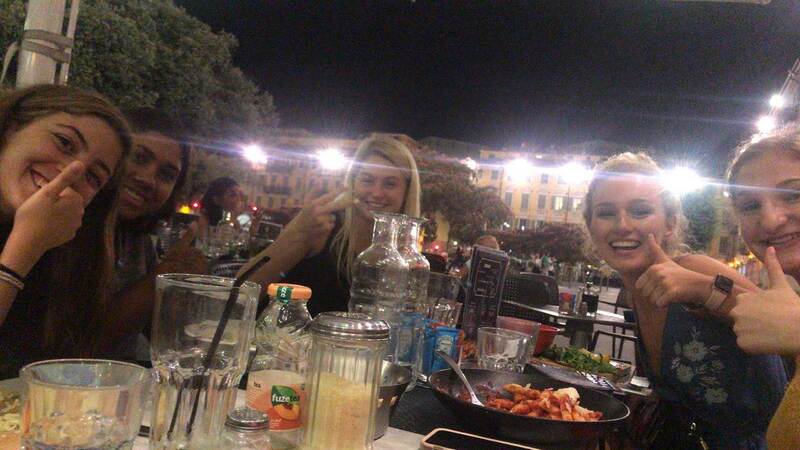 That same evening we said au revoir to our friends who spent three weeks in Nice via a send-off filled with beautiful photos of our adventures together, and of course something delicious to share! 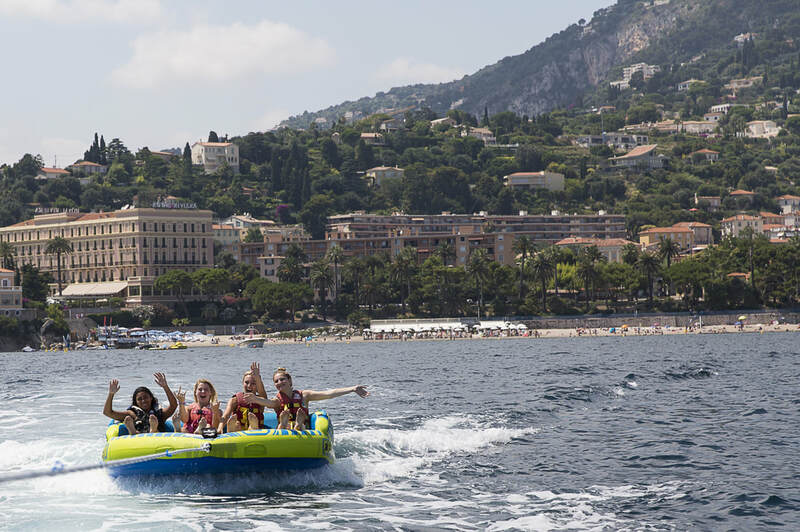 Friends were sure to benefit from their last moments together in Nice! 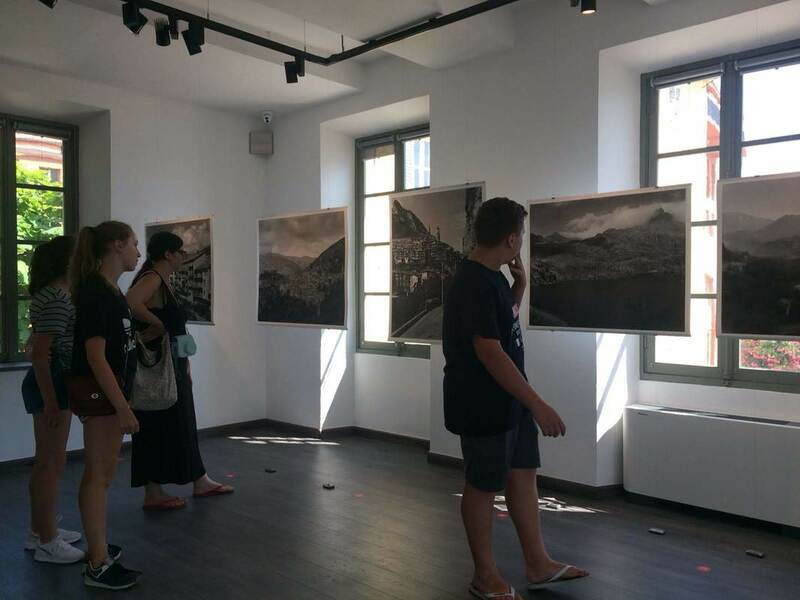 Culture & Conversation Course at a local exhibit on Wednesday. 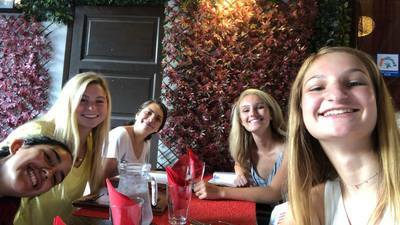 Trying out sushi in France! 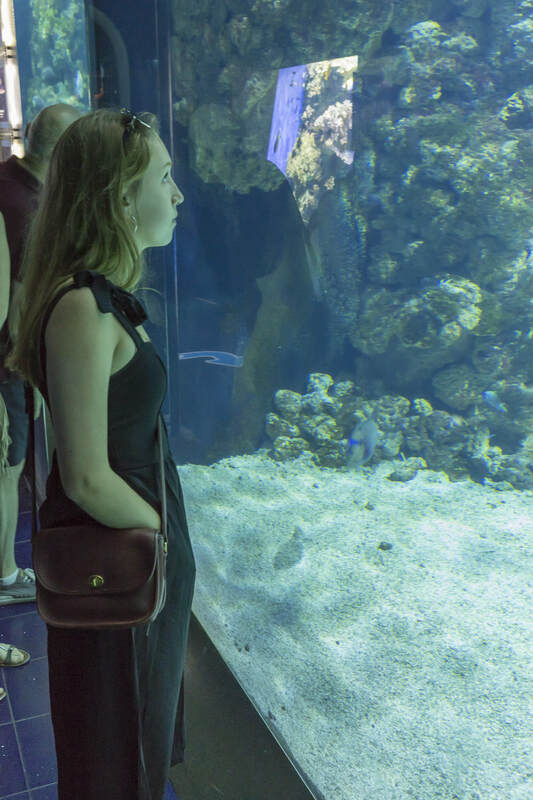 Taking in the unique architecture of the region. 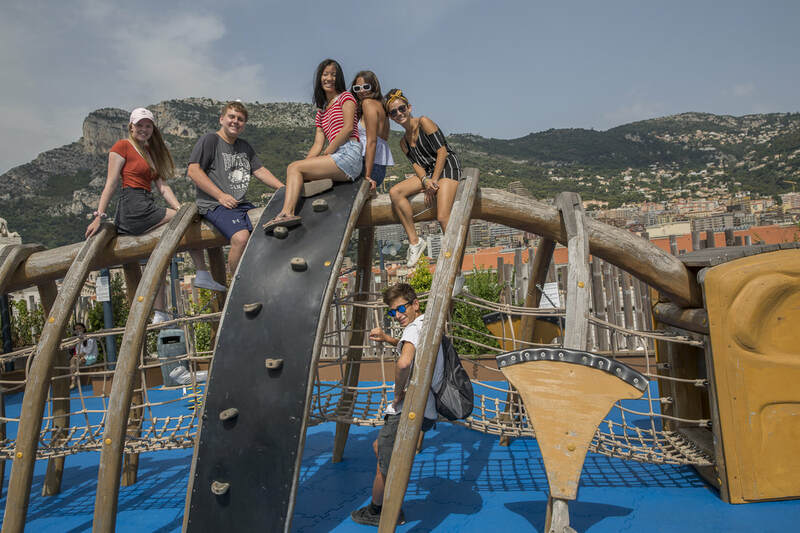 Taking advantage of some free time to explore the beautiful parks of Nice. Site of today's language courses - Musée Matisse! 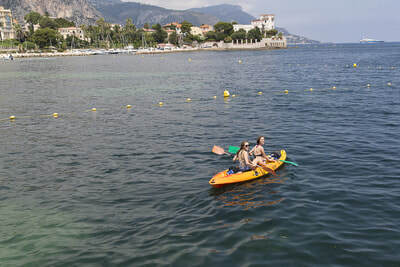 Relaxing and enjoying the last few days of Nice! 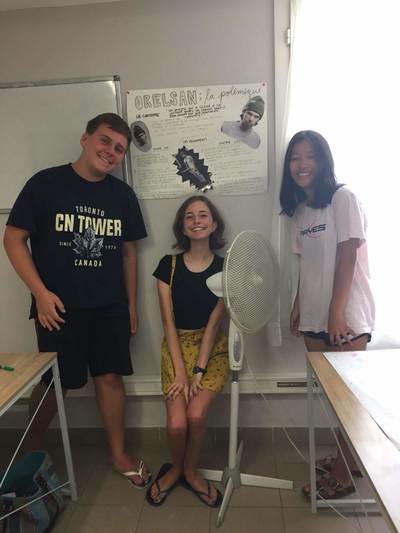 And, of course, students have been busy making progress en français. 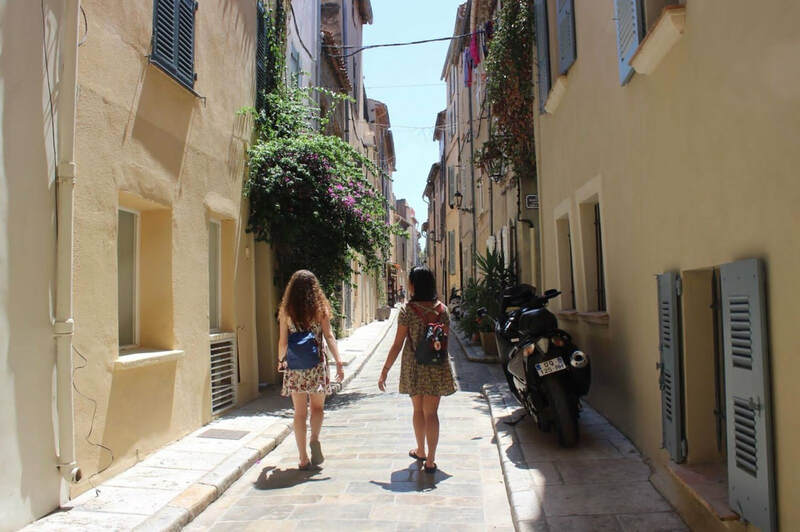 Whether its a guided experience in a local bookstore with Caro, analyzing (and singing along!) to popular French music with Sophie, or using skills learned from class with Mélissa to have a shopping adventure like a true francophone, students are continuously exposed to new and authentic opportunities to test out their French. 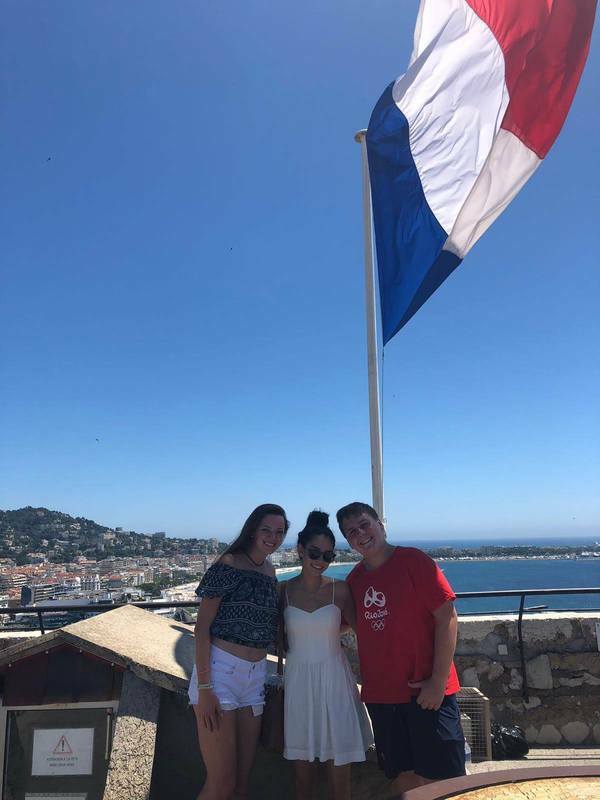 Check back soon to read another student post, as well as to follow our final adventures for this summer in Nice! 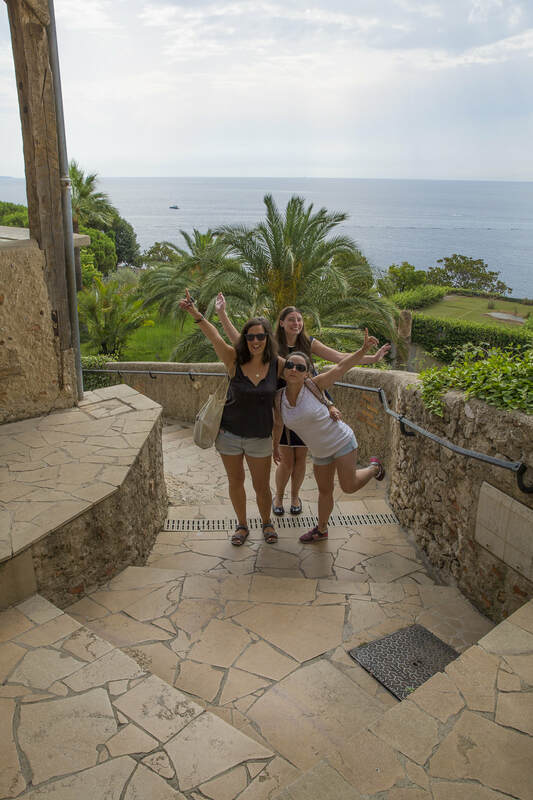 Le week-end means time to explore outside of Nice! This weekend we spent time appreciating our own neighborhood by eating at the nearby place on Friday night. 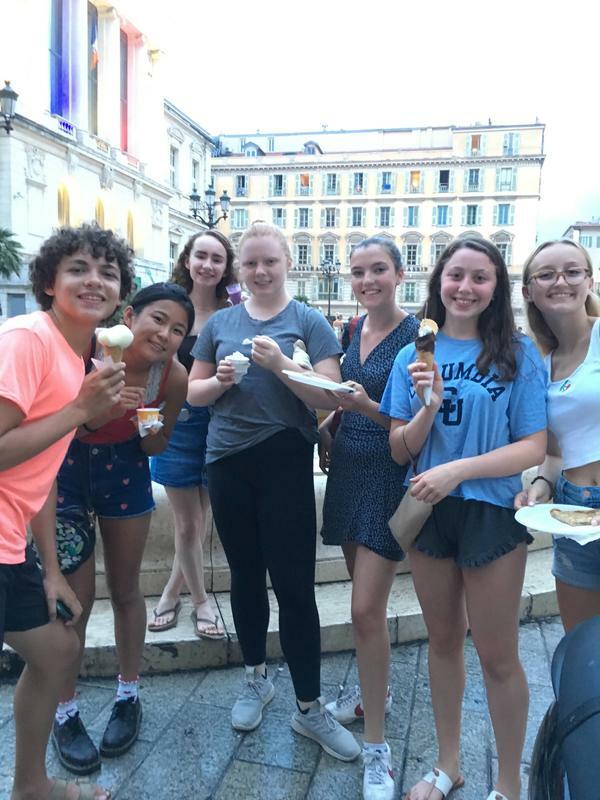 The rest of the week-end entailed a visit to St. Tropez, time at the beach, experiencing French cinéma, and of course, eating more gelato, but not without ordering en français! 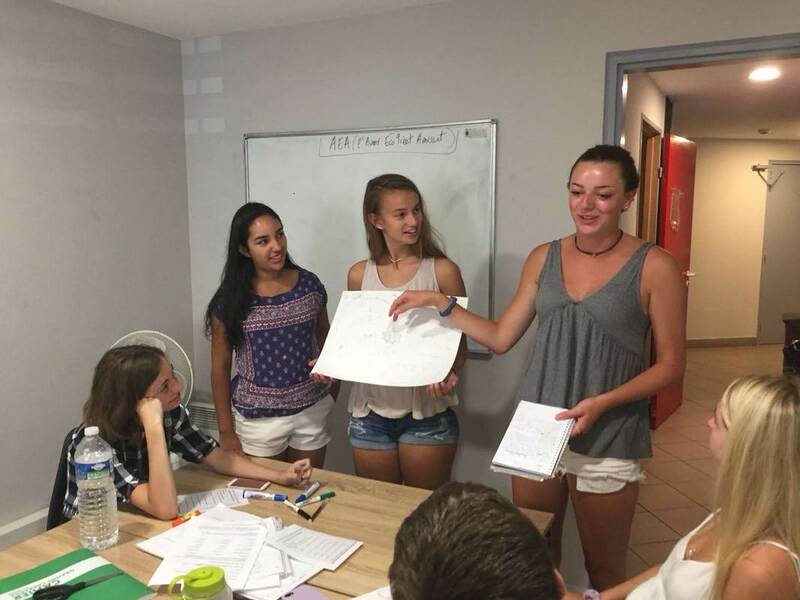 In today's post I want to take a moment to highlight the incredible work of our program teachers. 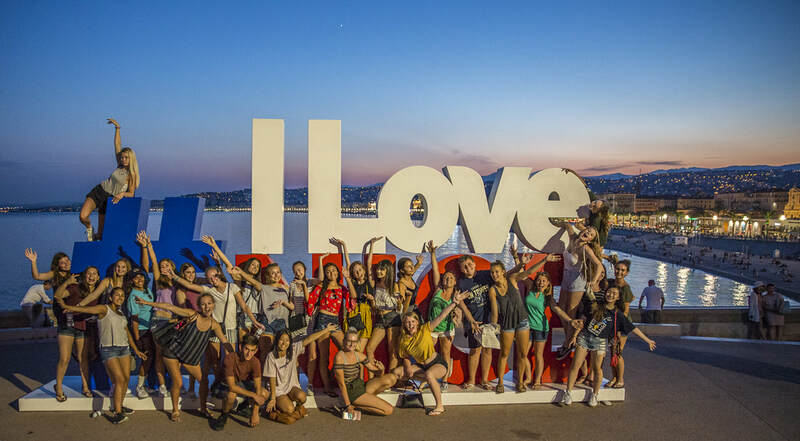 In our advanced language class taught by Caro, students have been studying the works of French rapper OrelSan, and were able to experience his music live this week as part of the Nice Jazz Festival! In the Culture and Conversation elective, students were able to learn more about the region through a prehistoric lens one day, and via ancient empires the next. 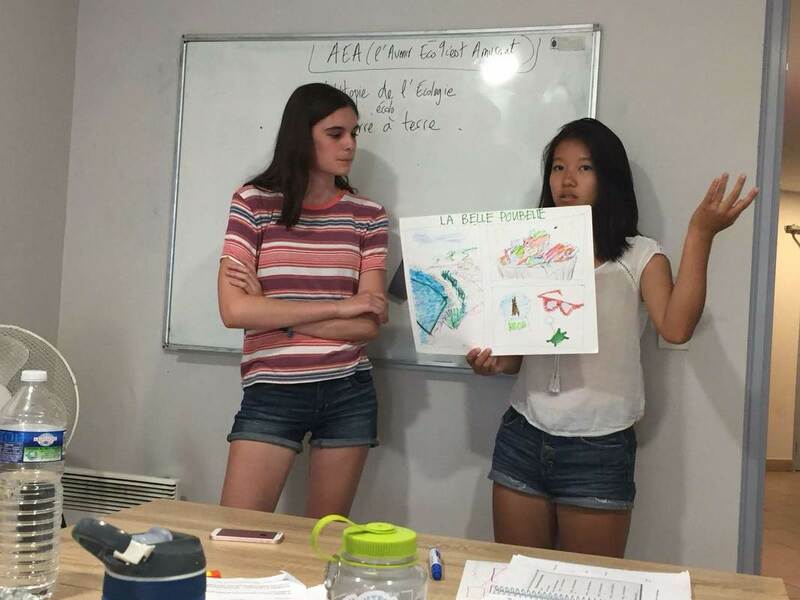 Meanwhile, back in language courses, there were both fun and serious conversations to be had about the environment. 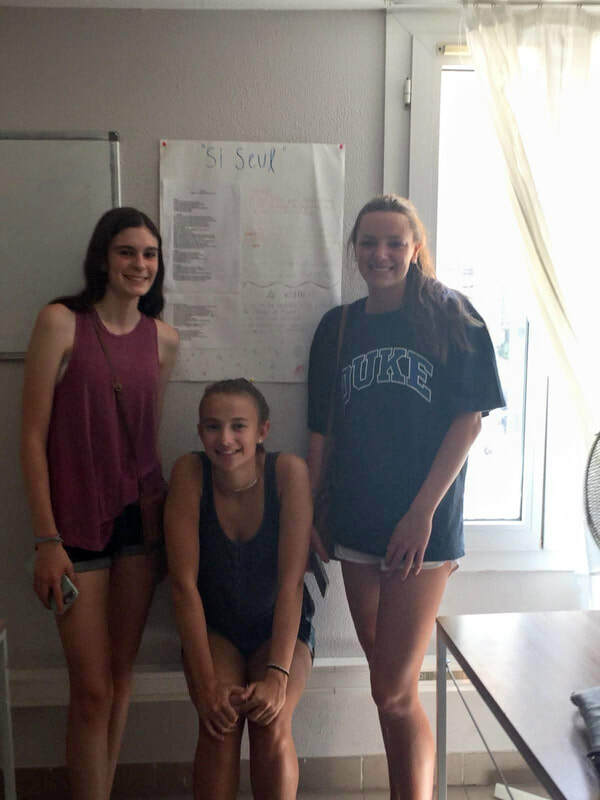 Students are able to balance their language classes and electives with both free time and group activities. 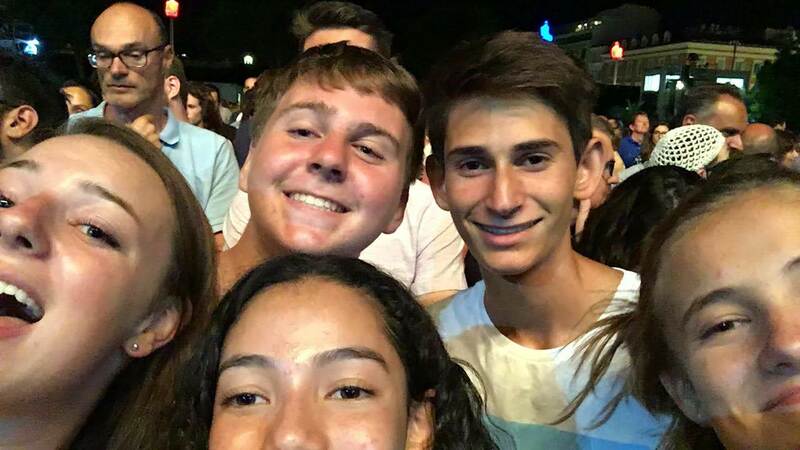 One group opted to see Jack Johnson as part of the Nice Jazz Festival (and hear him speak a little French! 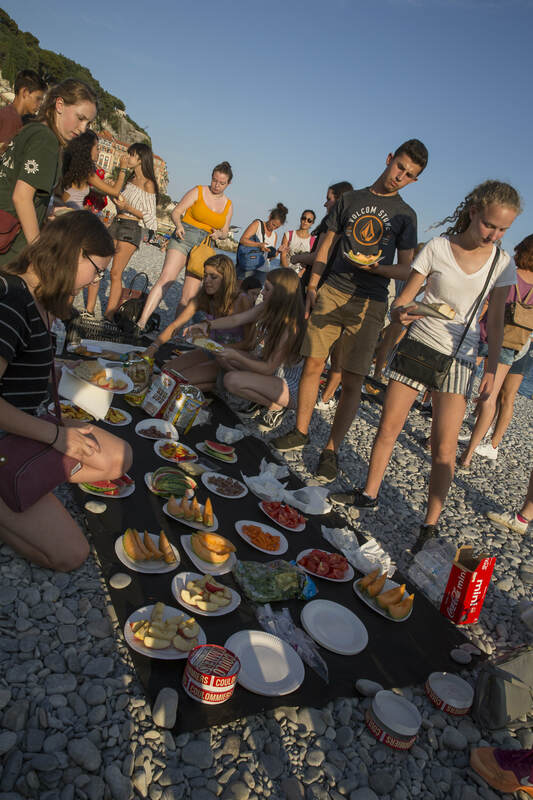 ), others enjoy exploring the culinary experiences to be found throughout the city, and there is of course always enthusiasm for time in the Med! 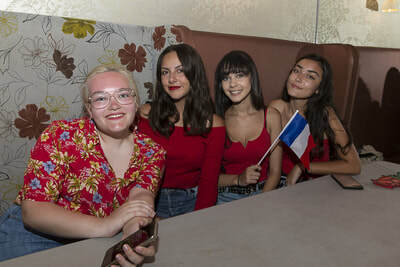 On est champions du monde!! 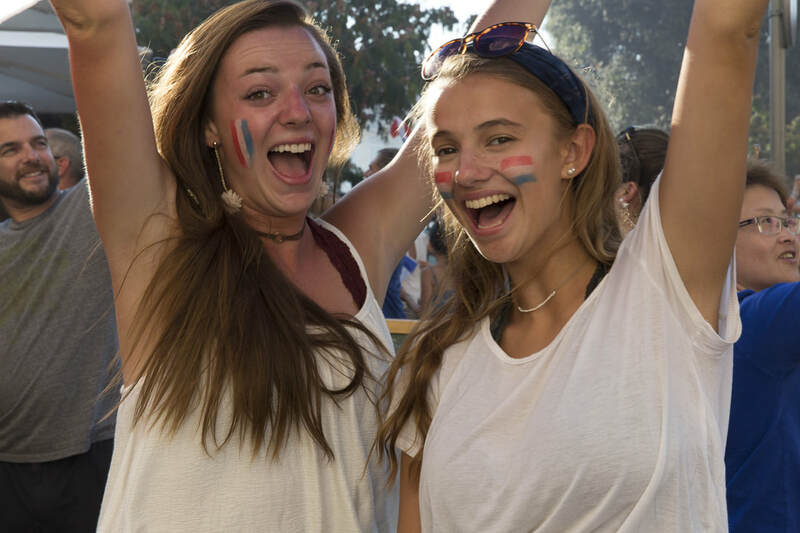 What a summer to be in France!! 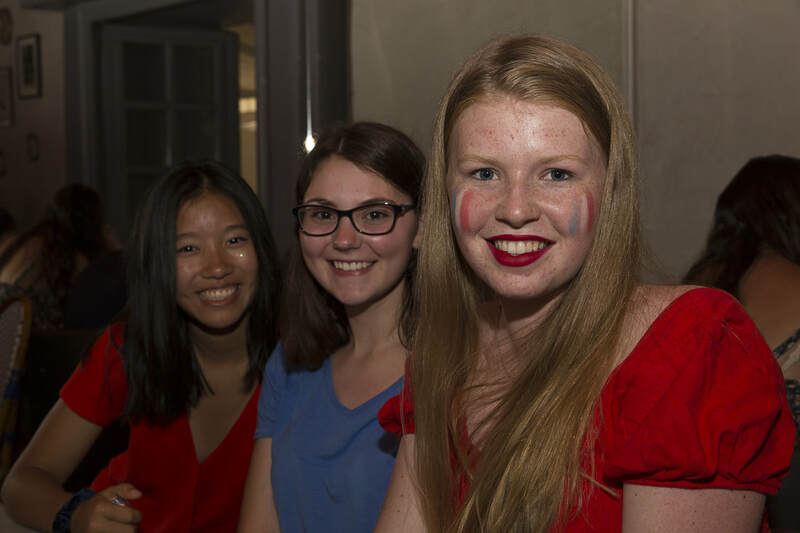 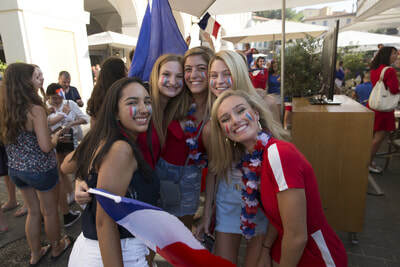 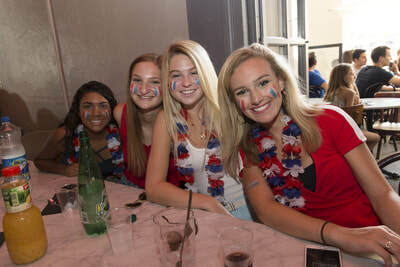 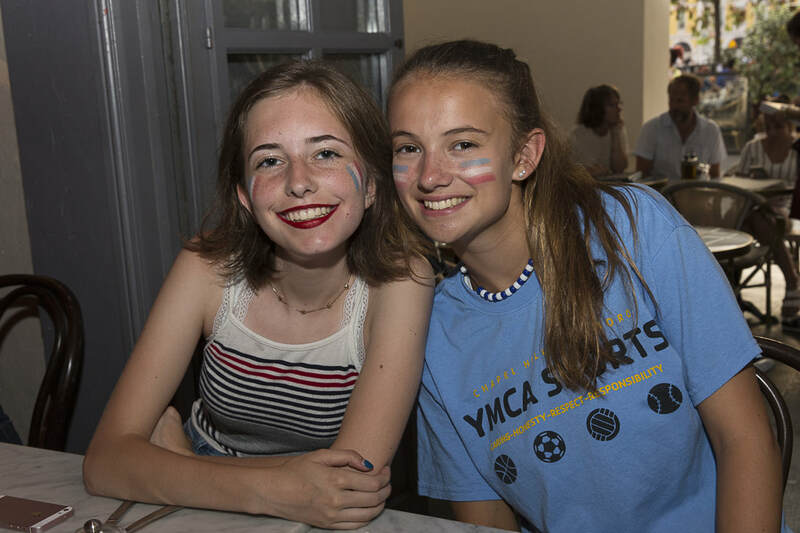 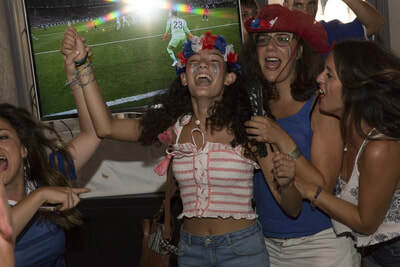 Students were able to take part in the joy and excitement of France's win over Croatia in the final match of the World Cup. 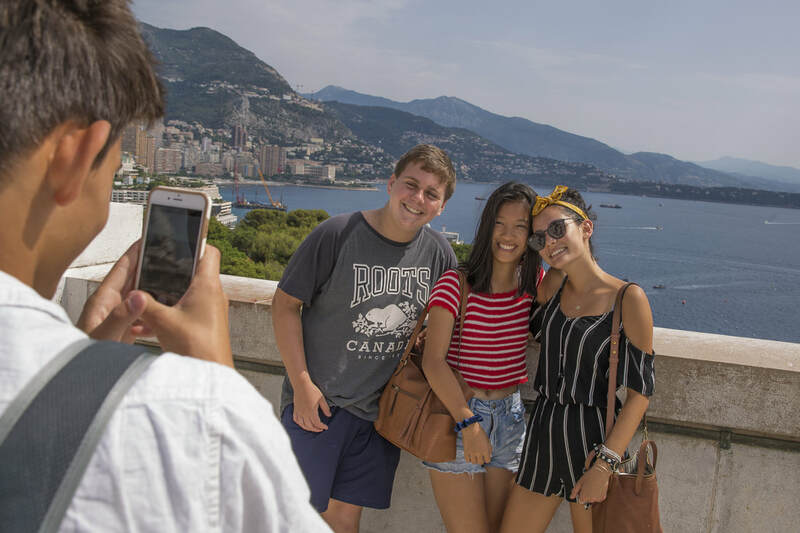 Stay posted for photos of our last day with our friends who completed the 2 week program today! 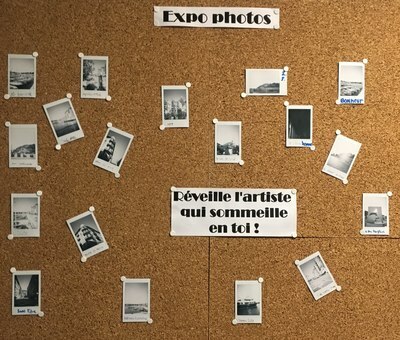 Les Spécialités Niçoises! We had a wonderful dinner of specialities from the region including pissaladière, socca, beignets, des farcies and of course pain bagnat. 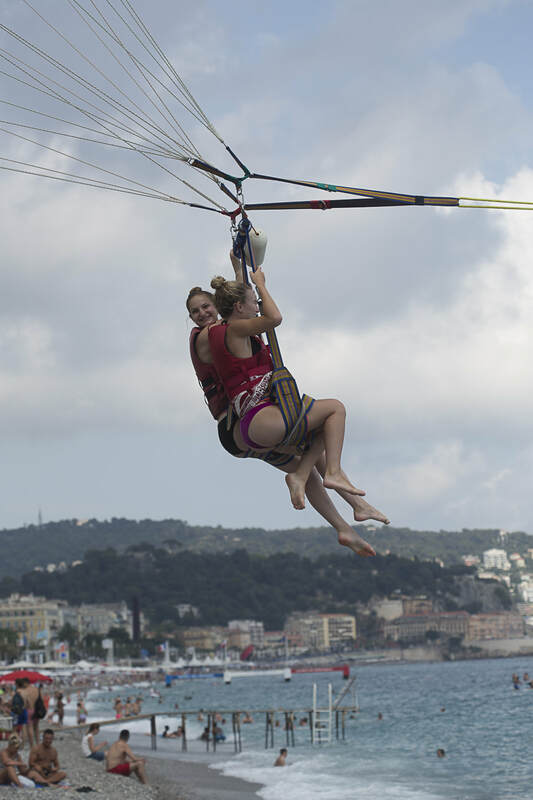 What an amazing way to see the entire Baie des Anges and les Alpes-Maritimes. 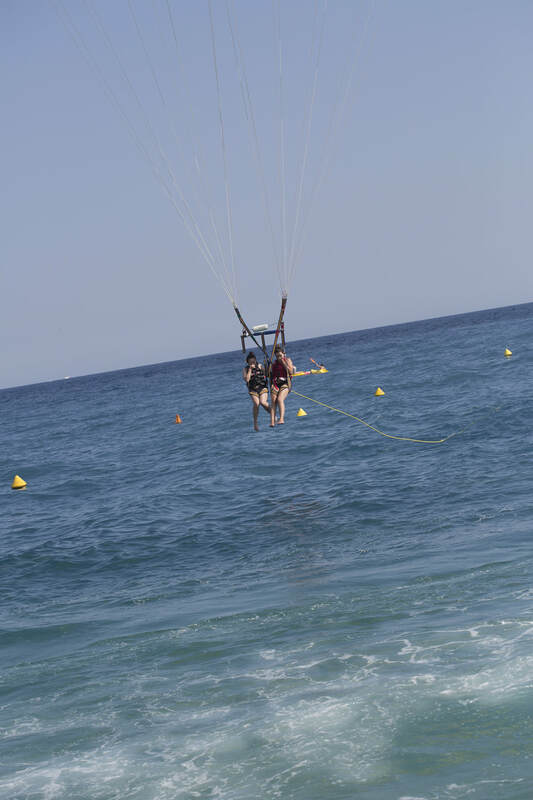 Take-off and landing wasn't always graceful but what views! 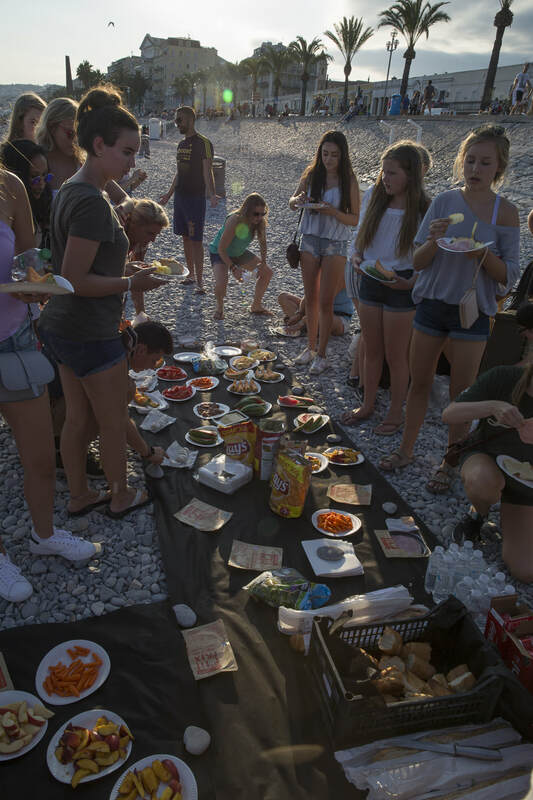 We also had the pleasure of meeting up with the group from Saint Laurent du Var for a sunset picnic on the beach. 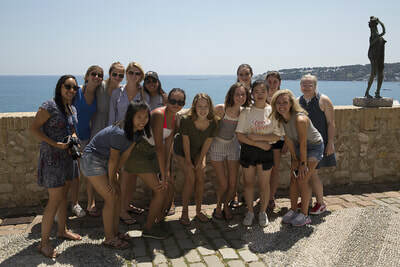 Saturday we adventured out of Nice a bit and visited the Principality of Monaco and the hilltop village of Eze. 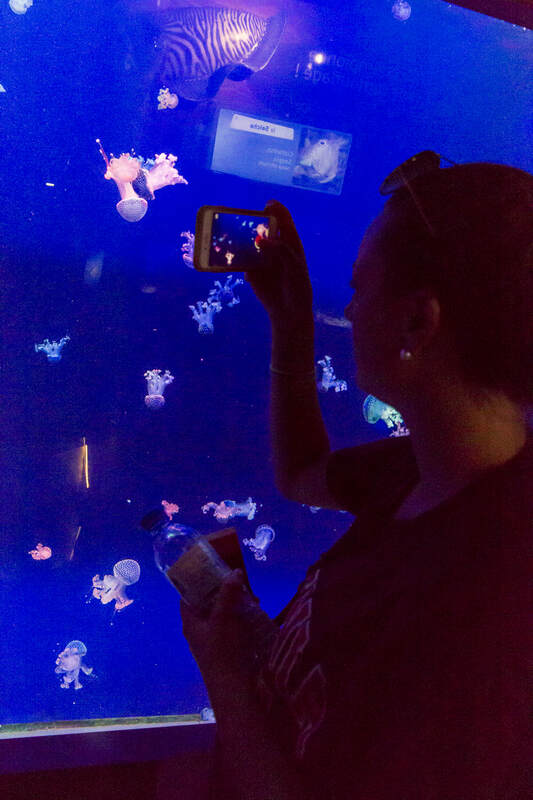 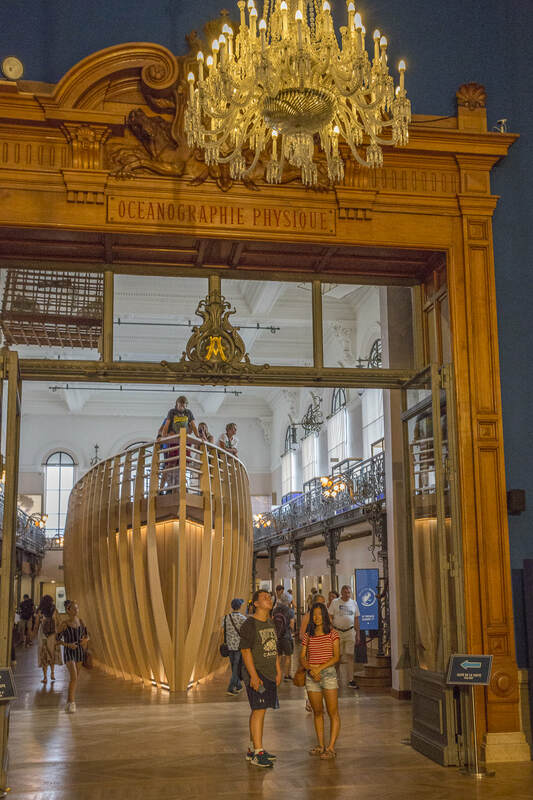 Some of us visited the royal palace while others got to experience the Musée Océanographique. 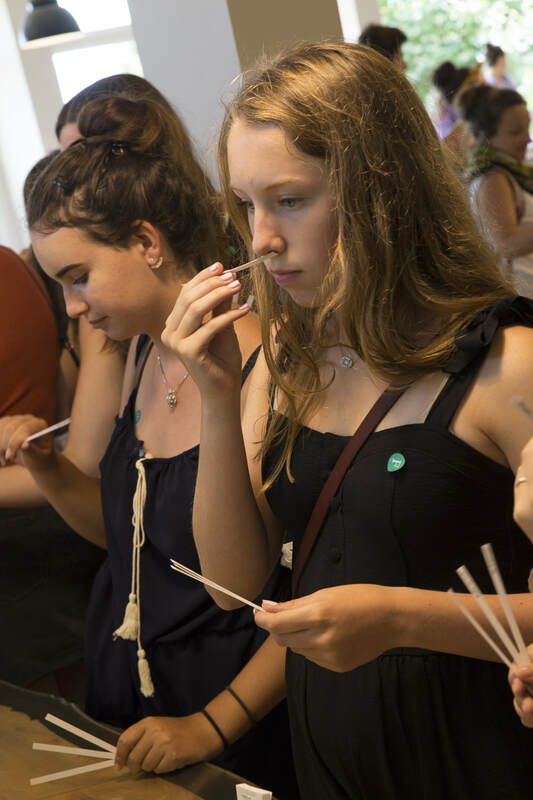 We also got an inside look at how perfume is made at Fragonard. It’s funny - you would think that taking a group of teenagers and dropping them off alone in a foreign country would be somewhat uncomfortable or uneasy for everyone - but our group was anything but. 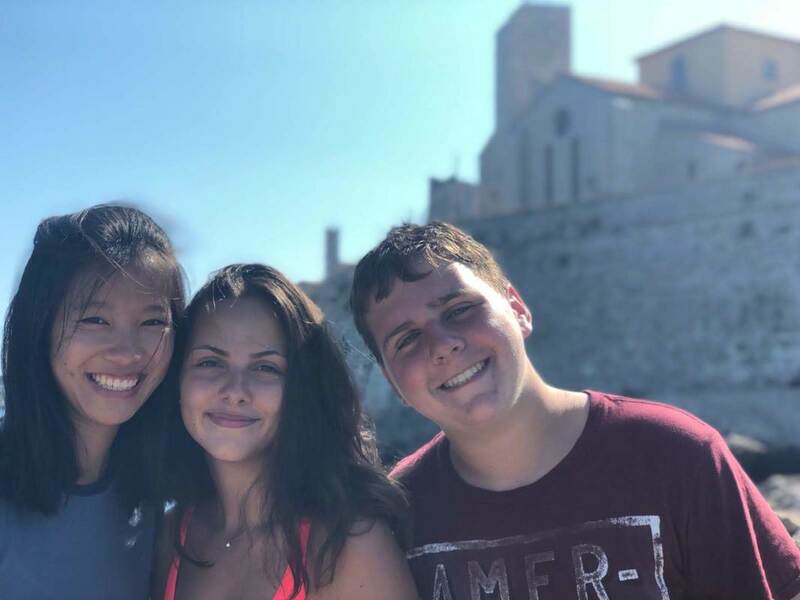 I was flying in from China, and was lucky enough to quite literally walk out of the baggage claim and right into the rest of the Nice group, and immediately became enveloped in what felt like hundreds of warm introductions and welcomes. 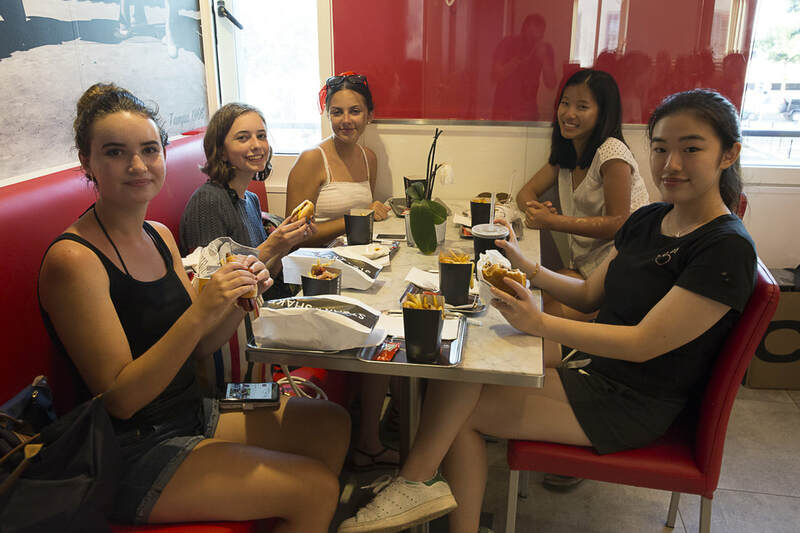 From the getgo, all of us felt comfortable and communicated with ease, and it became clear that we were about to have one of the best experiences of our lives. 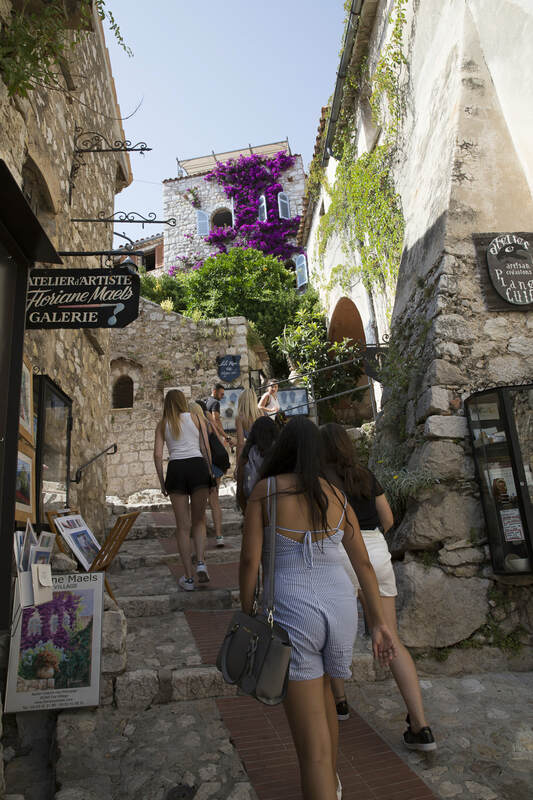 Other memories we’ve made include sitting on the streets or on top of mountains during art class, drawing the people and scenery that we saw. 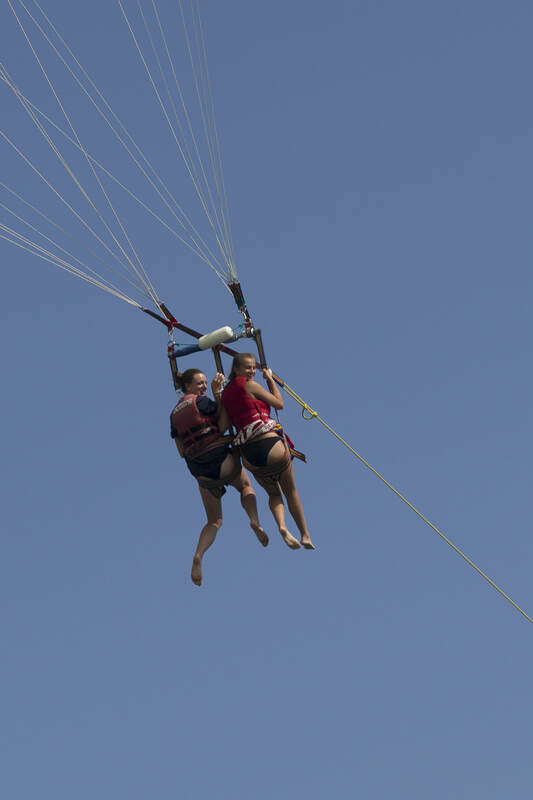 Some of us have experienced parasailing, tubing, kayaking, and more for the very first time. 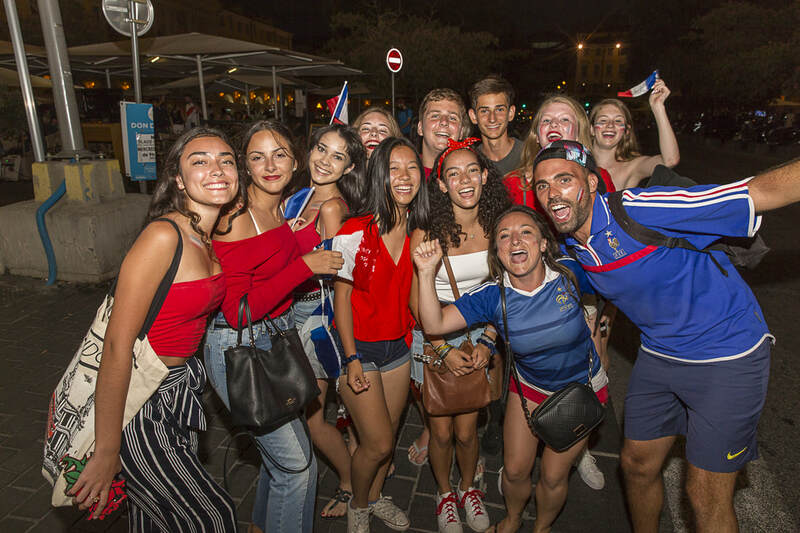 World Cup games surround us with excitement, songs, spirit, a weird patriotism towards France, and a whole lot of noise. 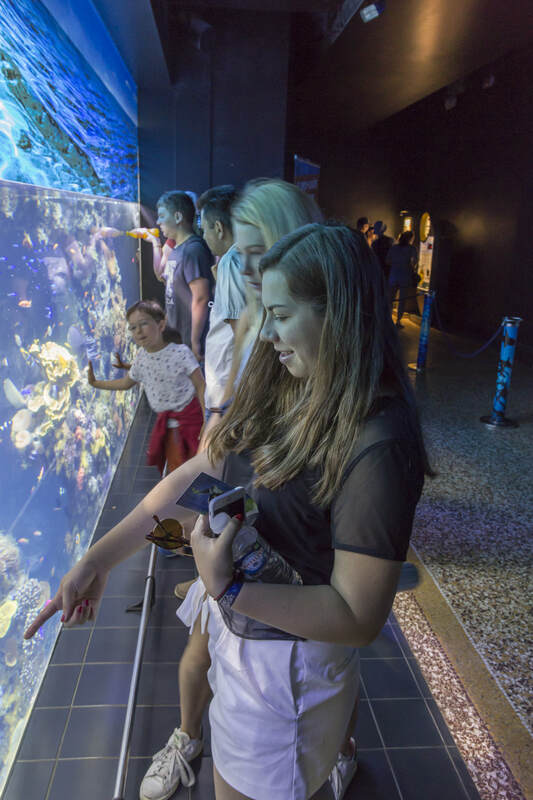 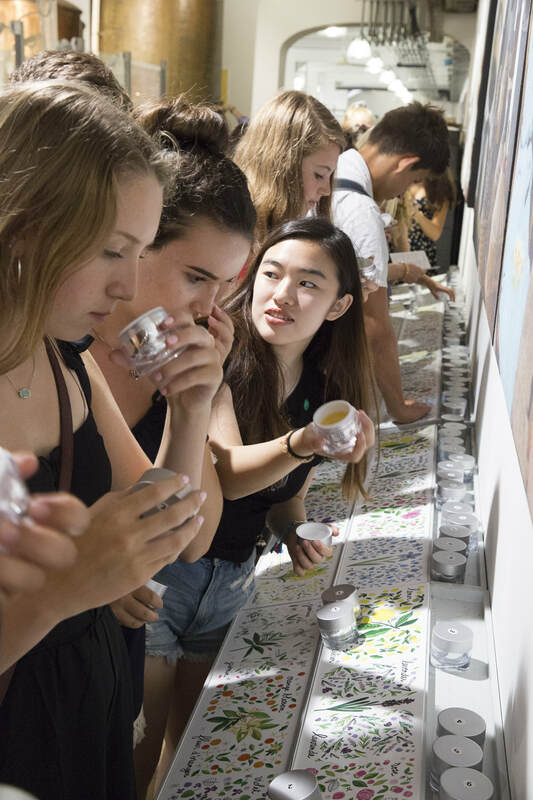 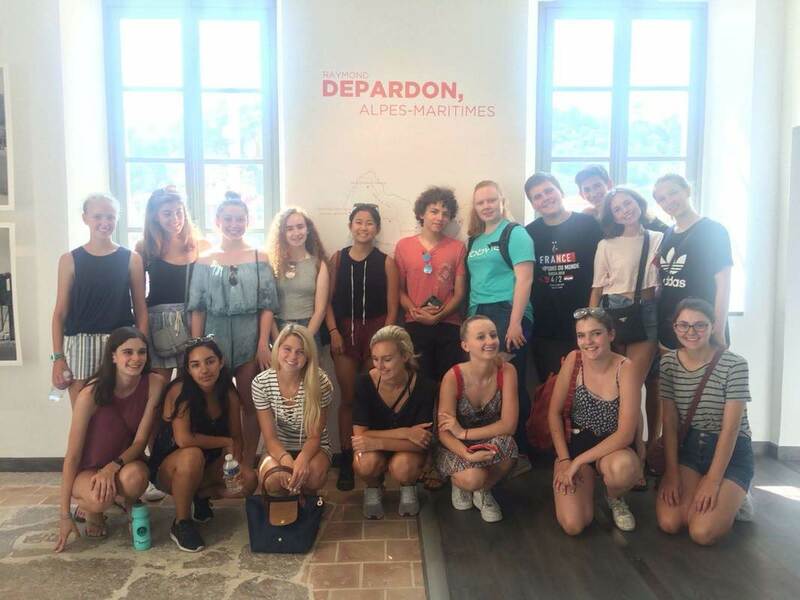 Our everyday classes are also one of a kind: unlike in school, we have the rare opportunity to access the local environment of Nice and interact with the people around us, simultaneously learning about culture, language, art, photography, and much more. Allez les bleus!!! 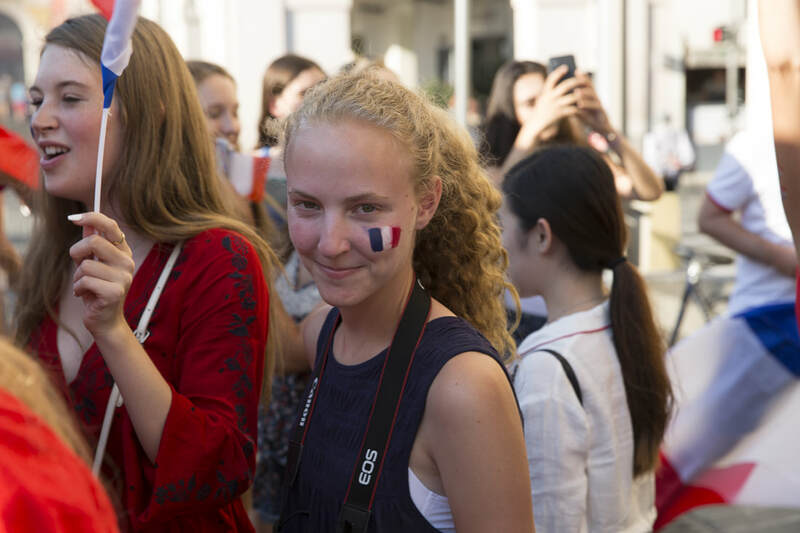 Exciting day in France!! 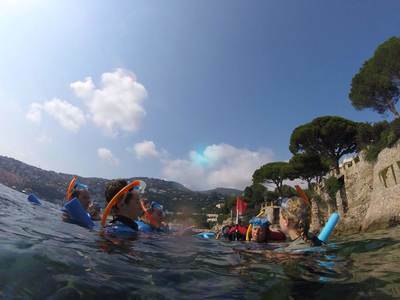 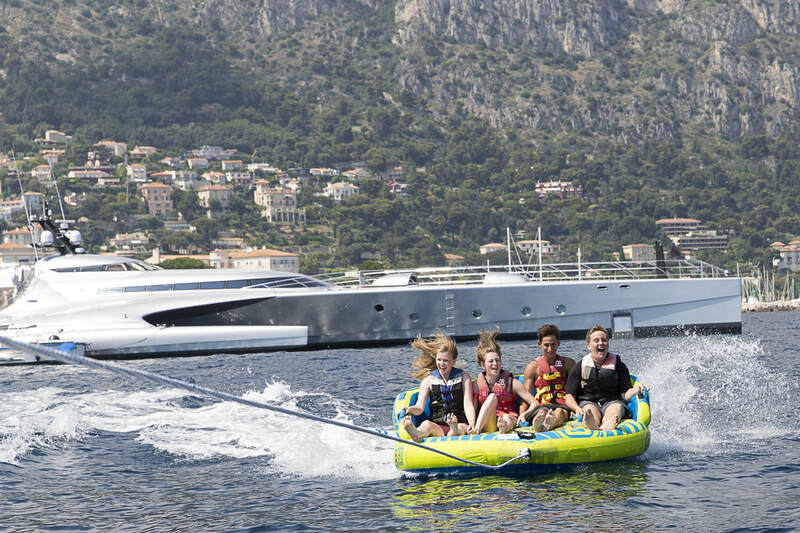 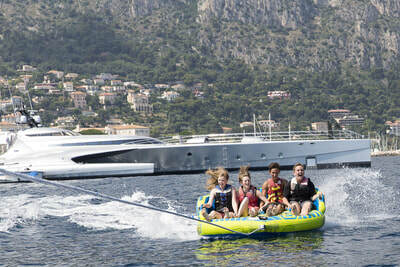 After a morning in class, students went to the beach in Beaulieu-sur-Mer to take part in some water sports. 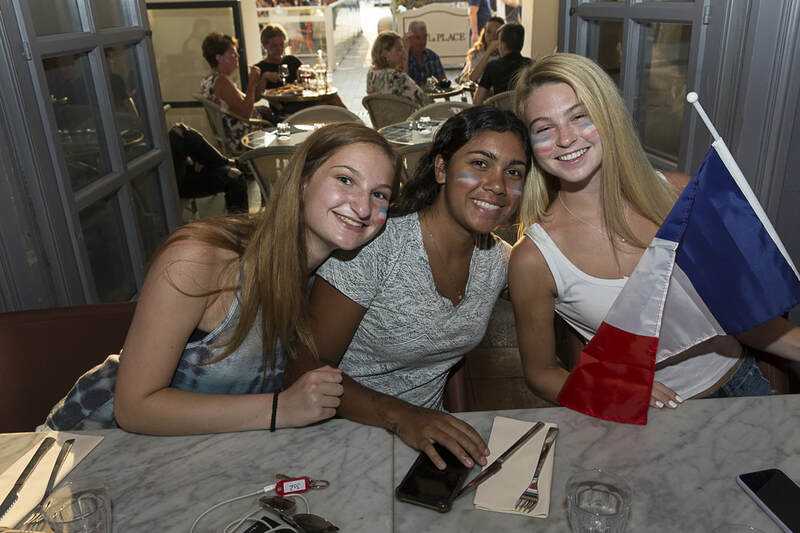 We spent the evening supporting les bleus towards their semi-final victory! 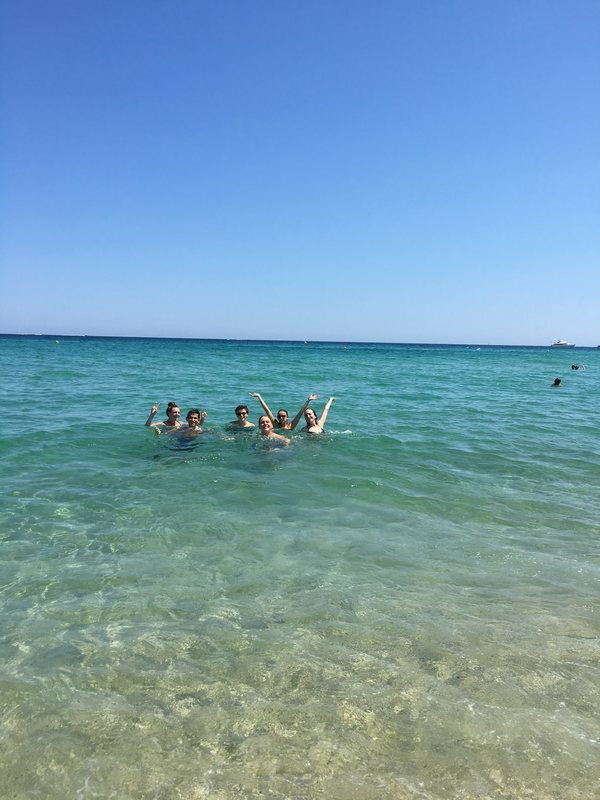 Week-end sur la Côte d’Azur! 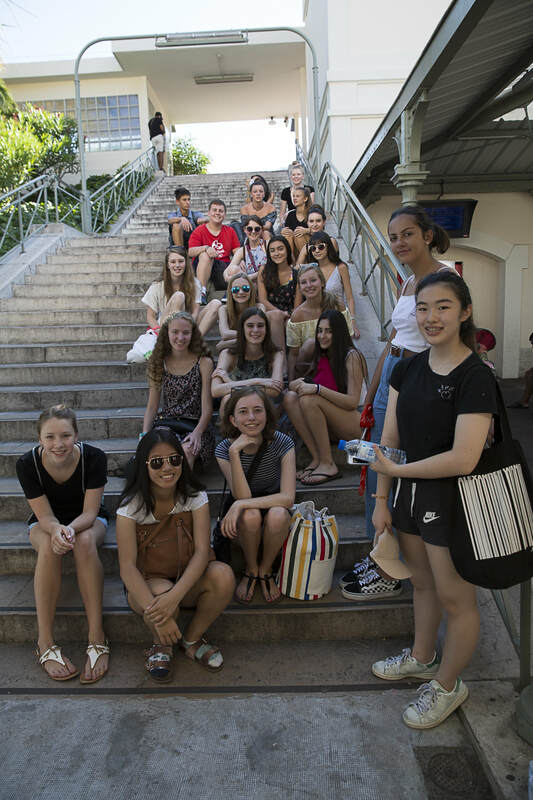 Students left in the morning to travel to nearby Cannes via train. 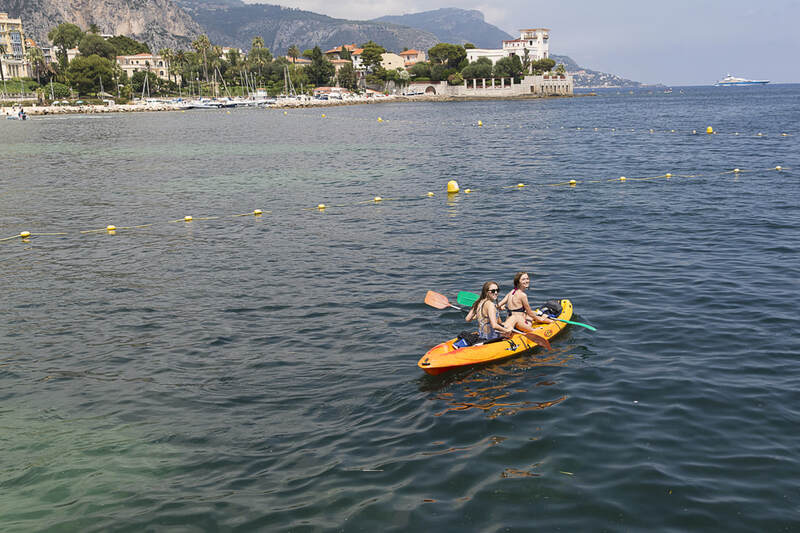 ... and to enjoy beautiful views of la mer​! 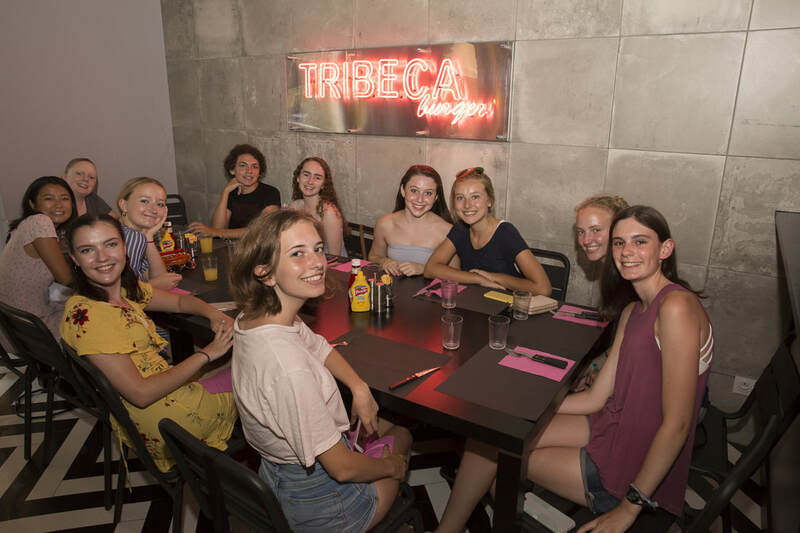 The long day ended with a chance to judge whether or not the "veritable milkshake américain" was as veritable as the restaurant claimed! 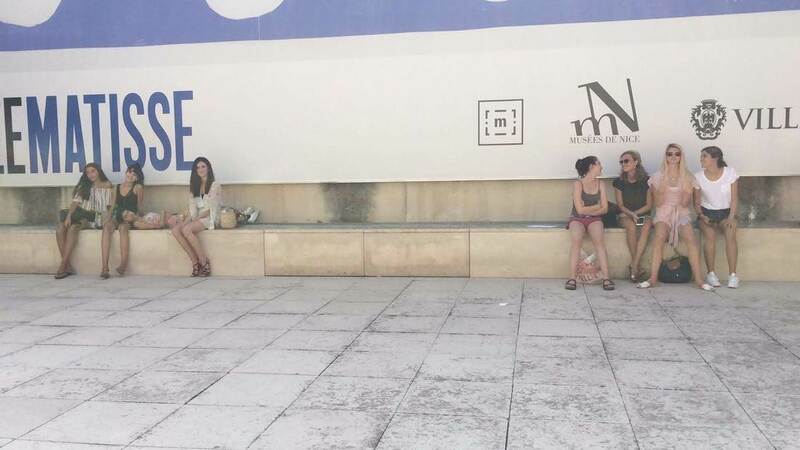 Another long day of soaking up the sights (and sun) of la Côte d'Azur. 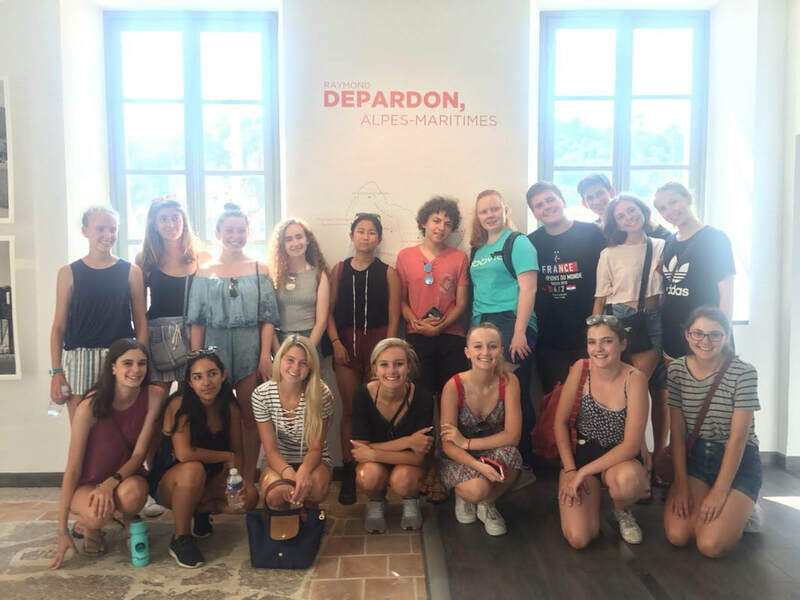 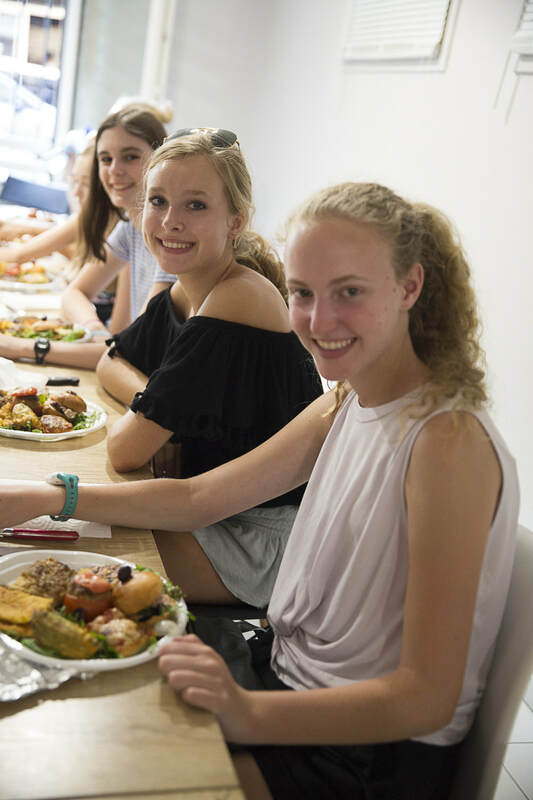 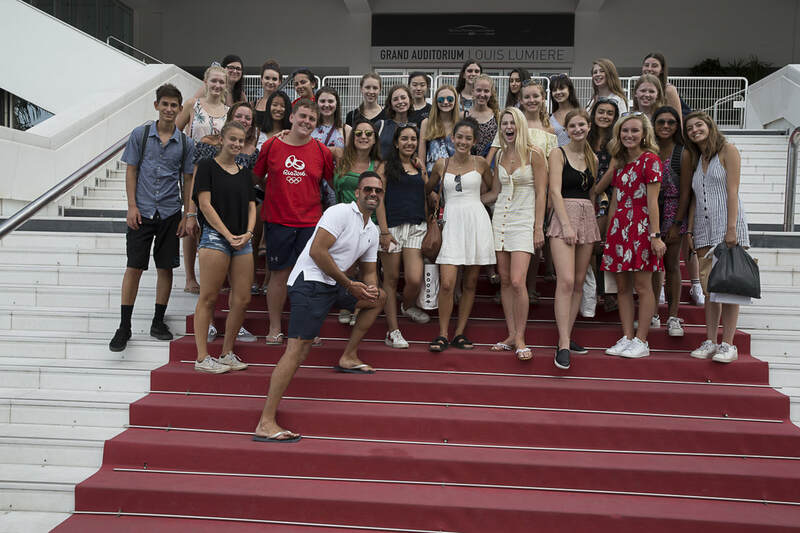 We begin the day by going to the town of Antibes via train, where students were able to explore an authentic marché provençal before heading to the Musée Picasso. 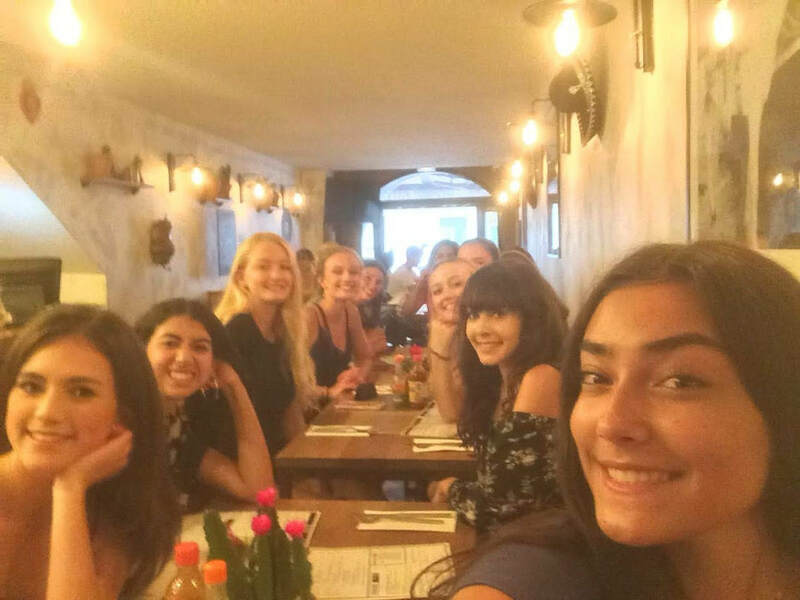 Picasso Selfie! 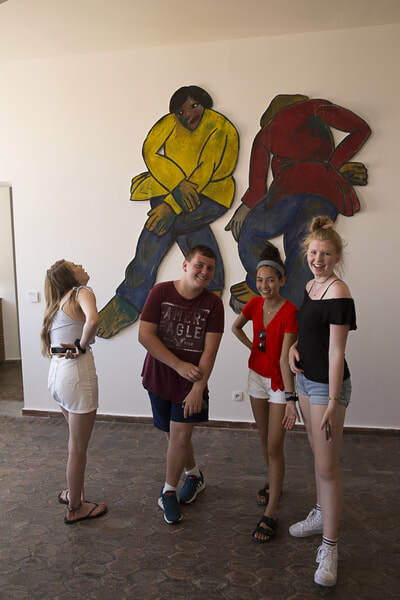 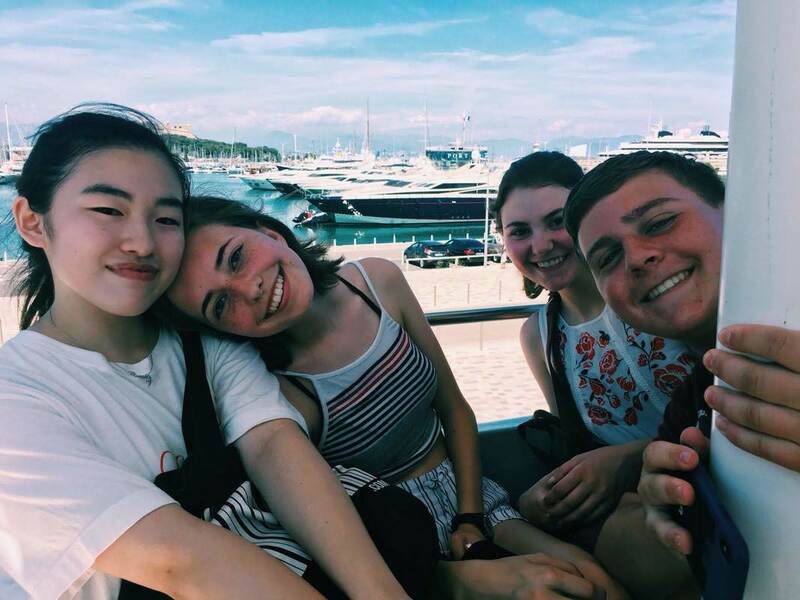 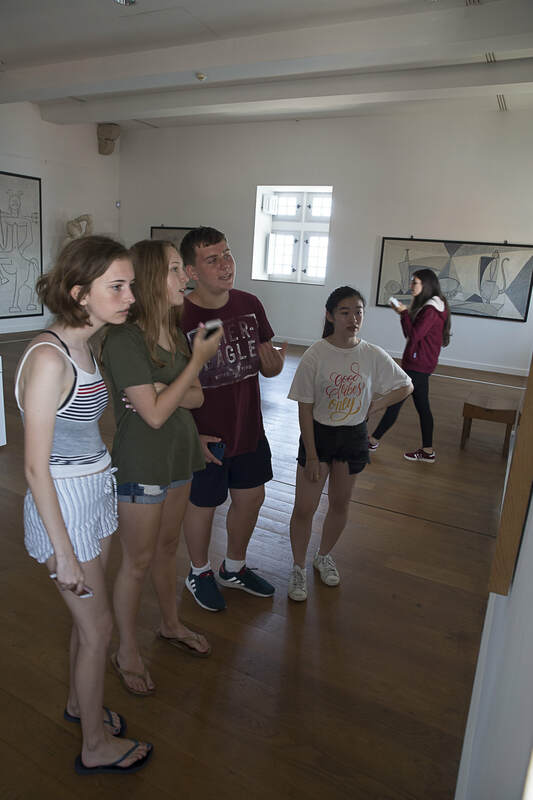 Photo Credit: Lily R.
Post-Picasso, students had the option to explore Antibes at their leisure. This included visiting other historical sights, trying local cafés and restaurants, taking in the beautiful views, and, of course, time to dive in the water for a break from the heat! 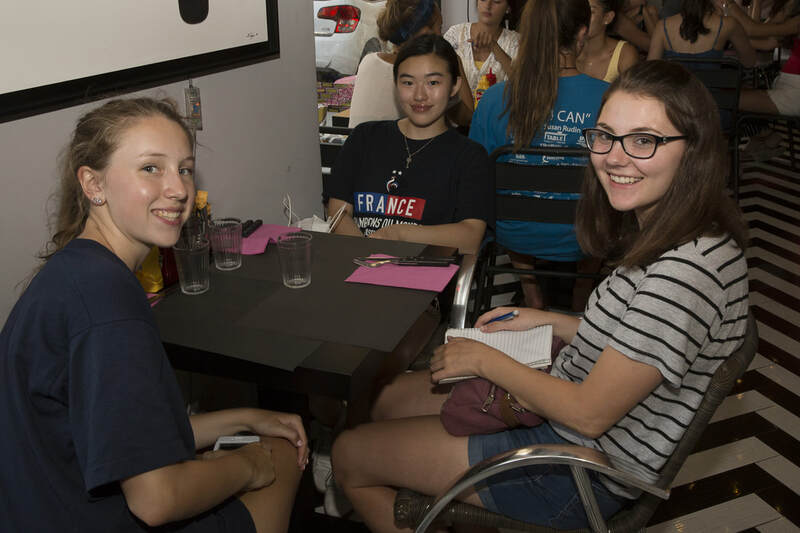 We will be hosting guest entries from students this week, I look forward to sharing their insights and experiences with you all! 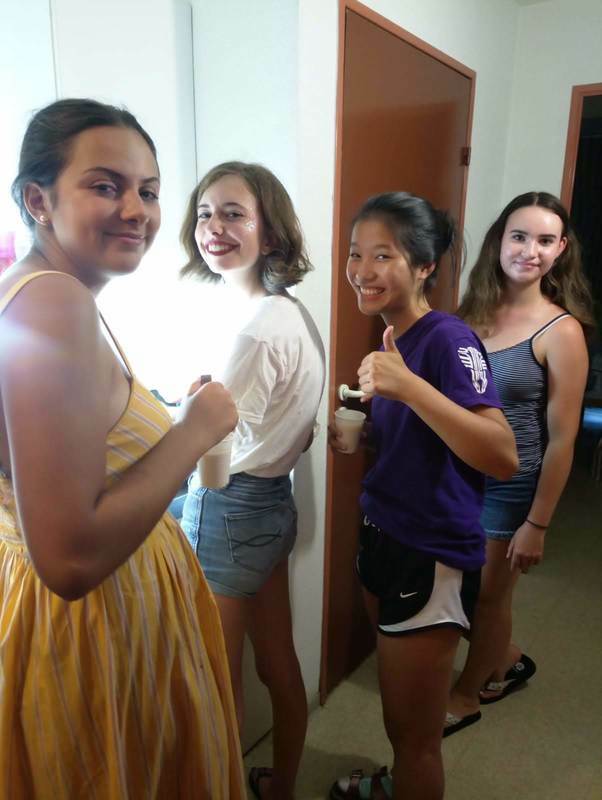 Today was the first day of classes! Students enjoyed attending courses while enjoying the beautiful weather and the scenic backdrop that is Nice. 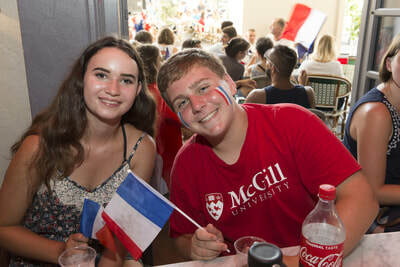 Language classes were followed by afternoon electives, and a chance to live the festive ambiance of the city as France advanced to the semi-final of the World Cup! 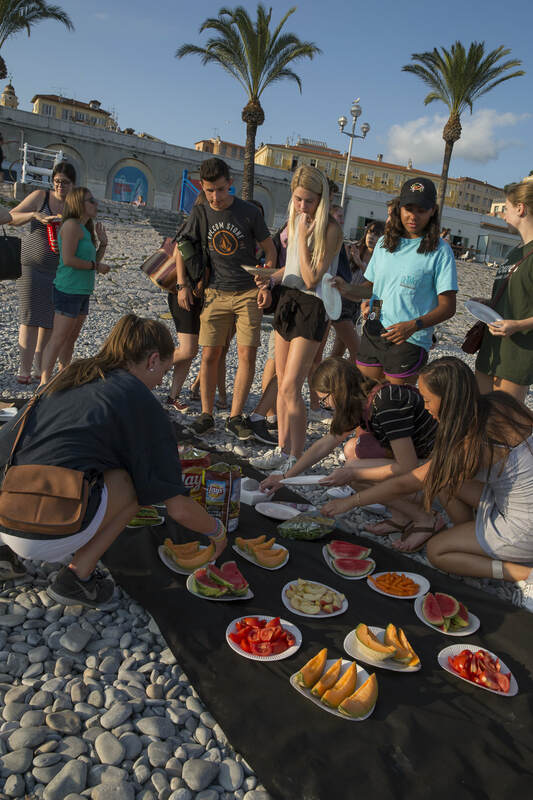 Tonight students tried out who could make the best crêpe! 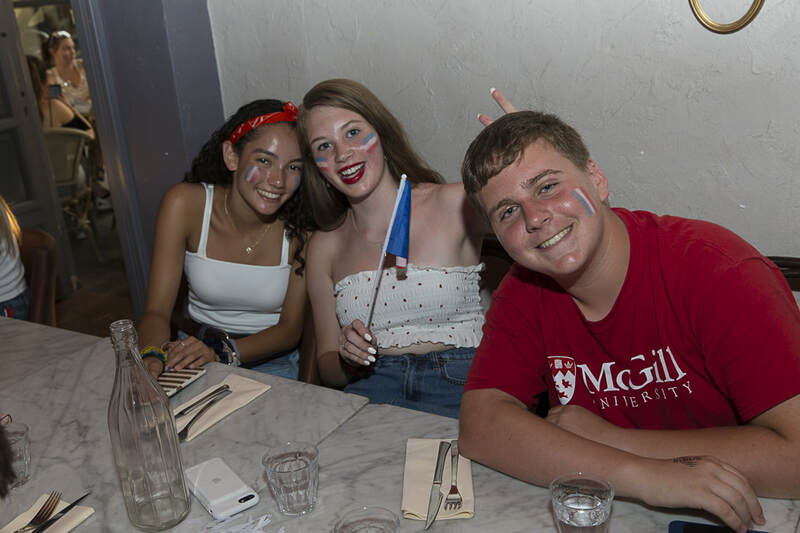 After crêpes, some students opted to watch Belgium advance over Brazil in the other quarter-final match, while others opted for a calmer evening at Place Garibaldi! 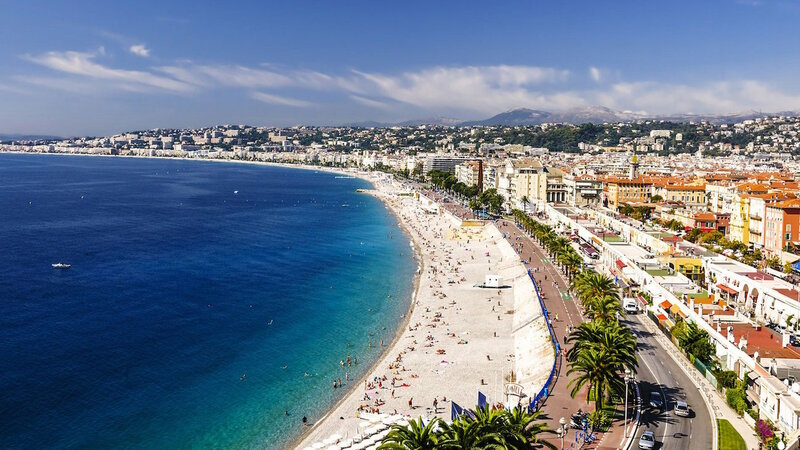 Stayed tuned for updates on tomorrow's excursion to Cannes! 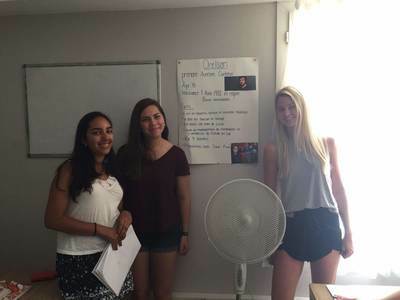 It was a calm day as we put things into motion to begin regular classes tomorrow. 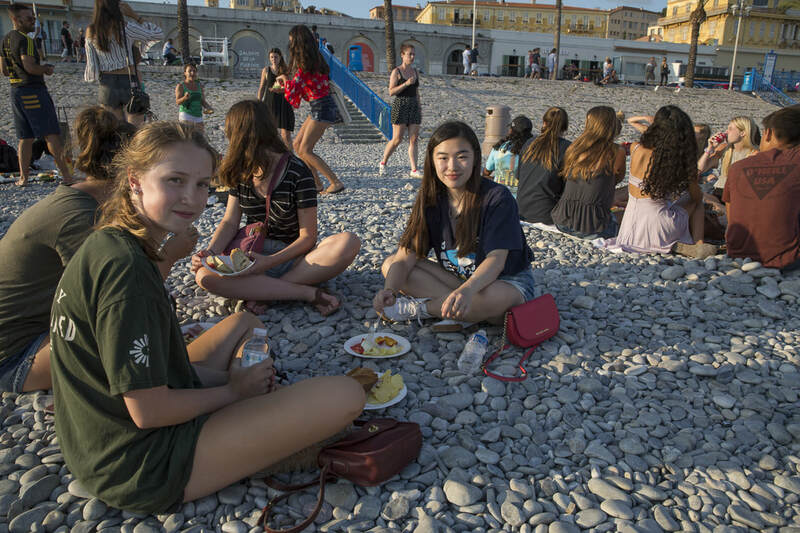 Students completed their placements for their French classes, and several students took advantage of the opportunity for some time at the beach! 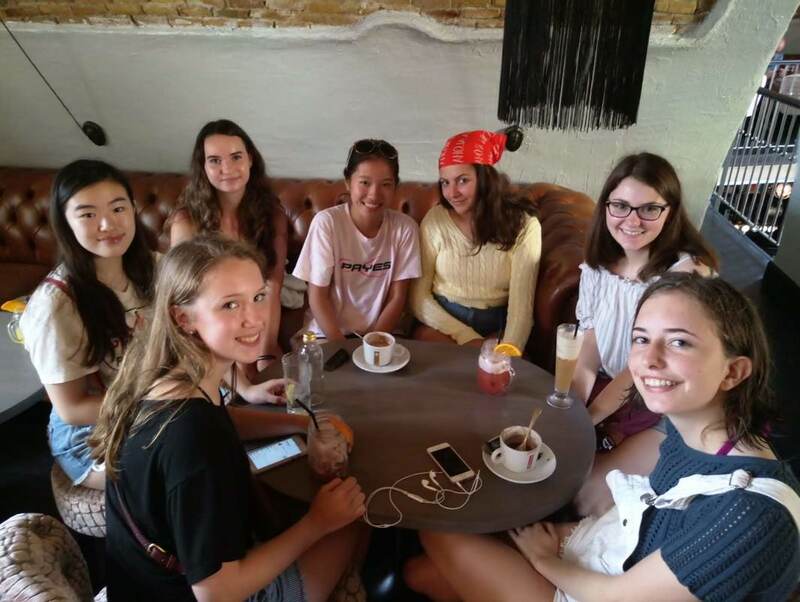 We experienced a rare torrential downpour during our afternoon excursion around the city, but teachers Caro and Mélissa were quick to get this group into a café to stay dry!